New Jersey signing Dave McKern says he hopes to make it "to the big time" by progressing his career on the island. The 26-year-old Australian plays at lock and has joined the Championship club until the end of next season. 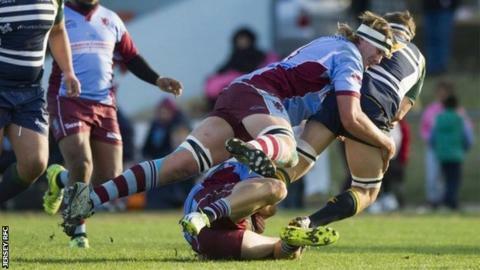 "One of the dreams is to move onto the Premiership," McKern told BBC Radio Jersey. "I'd obviously like to nail down a good starting spot and progress my rugby. I'd like to push and develop myself as a rugby player and a person." McKern represented UC Vikings in the last two seasons, at the top level of his home country. However, his Shrewsbury-born father was one of the reasons why he wanted to play in the English leagues. "The other day I got an email saying they (Jersey) were looking for me and they want me to come over straight away," added McKern. "I'd never heard of Jersey but I've been researching the place ever since and so far I've found it quite an interesting place. "As every kid dreams, I'd hope to make it to the big time - that would be amazing."